The pitches are spacious, well-defined,and they are located in a flat ground with shadow. We have at your disposal electric hook-ups for caravans and family tents. The price per site includes one caravan or one tent plus one vehicle. 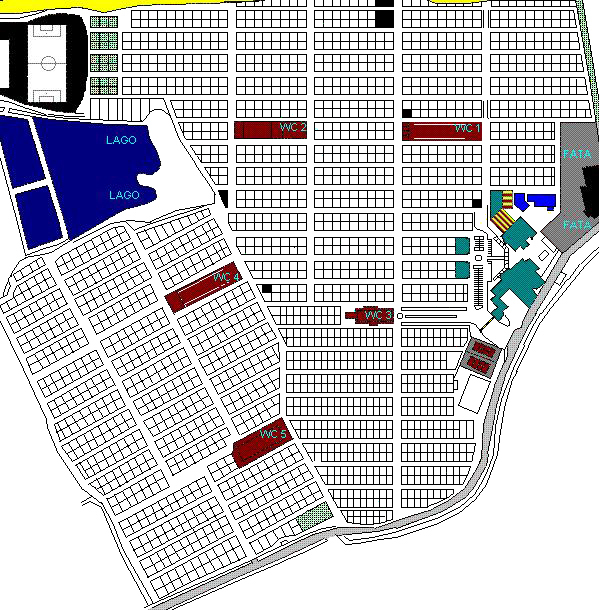 The Premium pitch are of 70 m2 and they are located in the central zone. We also offer free Wi-Fi for custormers. The camping site has sanitary booths with shower for persons with reduced mobility. Dogs are not accepted from August 02 to August 24. Reductions for early booking +2 nights in season low. Reservations for a minimum stay of 6/8 nights until september 23, Camping and Caravanning in Premium pitch, will have Breakfast included with a 50% discount on the Terrace "Els Cactus" from 8 to 11 a.m. hours + 2 hours of rent free of Kart Berg. The pitches standards have an average area of 65 m2. and are located in the central area and the right side "oliveres"
PACK CKE Pitch Camping, for holders of Card Camping Key Europe or CCI. The pack includes 2 adults + Premium picht + electricity 220 V. 5 Amp. + Wifi 1 free acces. PREMIUM Pitch 70 m2 with WiFi, discount up to 35% for stays in low season of 5 to 24 nights from April 5 to September 23 of 2019. Check online other discounts for stays in July and August. Minimum stay 5/6 nights with breakfast included. This supply requires to carry out a previous reserve by internet and is subject to availability, not being cumulative to other promotions. It's a very pleasant mobile home. It has 2 bedrooms, one bathroom with shower, a fully equipped kitchen, an outside terrace with garden furniture and a parking lot. It also has crockery, fridge, microwave, TV, WiFi, has bedding and bath. BREAKFAST INCLUDED AT SPECIAL PRIX FOR A STAY OF 3 NIGHTS IN LOW SEASON. A very comfy wood bungalow integrated into its natural surroundings. It has one double room, one bathroom, one kitchen equipped, a terrace and a parking lot. It has a refrigerator, a microwaves, a TV, WiFi and also sheets and towels. The owner must register and present at reception health papers and responsibility that demands the effective legislation and must indicate in the comments box when booking race and weight of the pet. No dogs from 2 to August 24. New bungalow IRM, very bright with covered terrace. It has 2 bedrooms, one bathroom, a fully-equipped kitchen with crockery, a fridge and a microwave , one covered terrace with garden furniture and a parking lot. The Bungalow also has TV, WiFi and bed and bathroom linen. News Mobil Homes O'Hara, very pleasant with double isolation. It has one double room, a room with 2 singles beds, dining room with a sofa bed one bathroom, an equipped kitchen terrace and parking for one car. It also has a refrigerator, a microwaves, a TV, Wi-Fi and sheets and towels. A very pleasant, practical wooden bungalow. It has 2 bedrooms, one bathroom, a fully-equipped kitchen with crockery, a fridge and a microwave , one covered terrace with garden furniture and a parking lot. The Bungalow also has TV, WiFi and bed and bathroom linen. It is a very pleasant and functional bungalow. It has one double room, one bathroom, one equipped kitchen, a covered terrace and a parking lot. It has a refrigerator, a microwaves, a TV, WiFi and also sheets and towels. BUNGALOW 2/4 Pax type B. Discounts up to 35% for stays in low season of 3 to 24 nights from April 5 to September 23. 2019. Check online other discounts for stays in July and August. Minimum stay 3/4 nights WITH BREAKFAST INCLUDED.